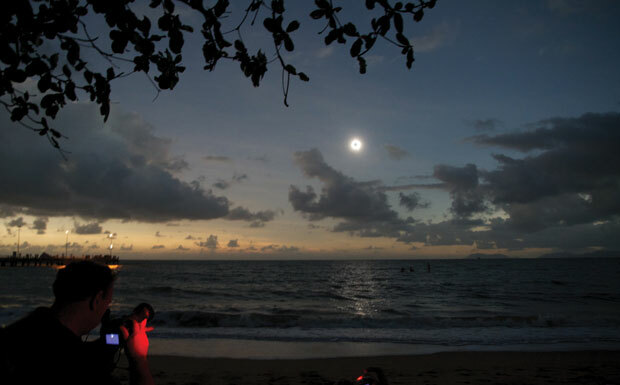 The clouds clear and the Sun is eclipsed at Palm Cove. Image: Steven Young. A total eclipse of the Sun is truly a miracle of nature. Our Moon happens to be just the right size, that at just the right distance from Earth, when the angle of its orbit intersects with the Sun at just the right time, it will completely obscure the solar disc and cast its shadow over one narrow swathe of the Earth’s surface just a few hundred kilometres across for just a few fleeting minutes in any one place. 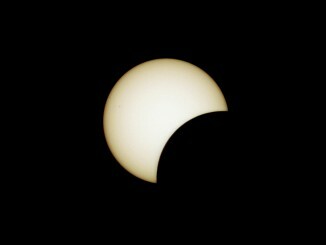 But another miracle was needed for those who travelled to Australia to see the only total eclipse of the Sun of 2012 – a clear patch of sky. Because of the extraordinary set of circumstances needed for a total eclipse of the Sun, only about 70 occur each century and they are frequently only visible from some of the least hospitable and uninhabited parts of the world. Eclipse watchers had endured a long totality drought after the eclipse of July 2010, so hopes were high for November 2012. In May 2012 an annular eclipse, where the Moon’s orbit takes it too far away to obscure the entire solar disc, was the warm up show for many. Although spectacular, it’s dramatic ring of fire cannot be compared to the majesty of observing totality with the naked eye. With totality moments away, eclipse watchers, bathed in silvery light, prepare to remove their protective glasses. Image: Steven Young. Typically, much of this eclipse track fell at sea, crossing almost the entire Pacific Ocean from the north-east corner of Australia to just off the coast of Chile in South America. 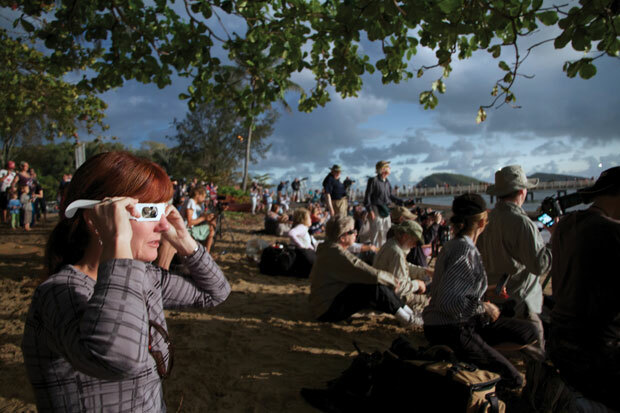 On dry land, north-east Queensland offered the best options and that is where Explorers Astronomy Tours chose to bring a large group of eclipse chasers from the UK led by Dr John Mason, a veteran of many eclipse expeditions. Scouting out the perfect location along the eclipse track is something that starts years in advance for John. 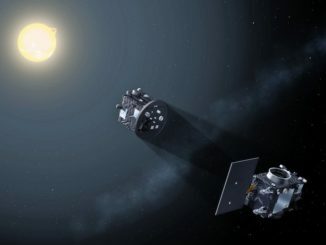 Weather satellite data is strung together in movies to better understand the cloud patterns for that time of year and two years ahead of the eclipse, an advance party from Explorers travelled to Queensland to seek out specific viewing locations. Palm Cove was the classic tropical beach: a sweeping crescent of golden sand, lined by palm trees, overlooking the Coral Sea and framed by a peninsula on one side and islands on the other. The tide would be coming in at the time of the eclipse but there was plenty of room for thousands of eclipse watchers. In the days leading up the eclipse, John trekked the short distance from the hotel to the beach at sunrise to observe the cloud cover. Half the times the eclipse would have been visible, half the time cloud would have obscured the view. On the eve of totality, John briefed the Explorers group in a packed hotel meeting room. He had made the difficult decision not to divert the group to a back up location inland that would have required a three hour bus ride in the dead of night to a site with few facilities. Given the weather conditions it was 50:50 that totality would be visible. The best he could offer to the anxious group was that it would definitely get very dark at 6:38am the next morning. Before dawn a steady stream of observers left the hotels and made their way to the beach. The eclipse was due to get underway ten minutes after sunrise with what is known as first contact, when the disc of the Moon moves into view. The brilliant orange orb of the Sun rose above the horizon and promptly disappeared into the cloud. After some tantalising early glimpses of the partial phase, the clouds closed in to start nearly 45 minutes of excruciating anxiety. 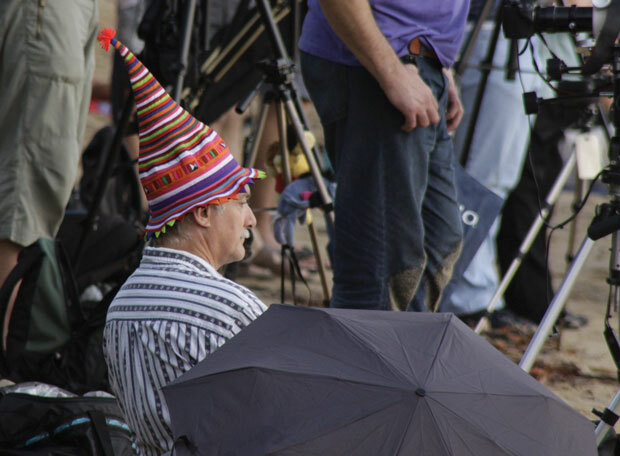 Dr John Mason, wearing a trademark hat, waits in hope of clear skies during the anxious build up to totality. Image: Andrew Brown. Astronomers are generally rational people, driven by science and data but they are not adverse to a few lucky charms. For Linda Storey, who served as Astronomy Now’s Editorial Assistant for many years, it was a bracelet of crescent Suns and for John it was a pointed, multi-coloured, striped hat. The brilliant diamond ring at third contact. Image: Michael Maunder. Whatever the reason, the clouds indeed parted with ten minutes or so to spare. 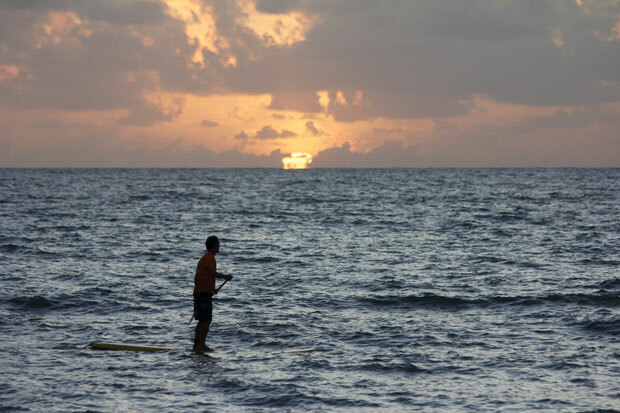 An extraordinary silvery light fell across Palm Cove that grew darker and starker as the final sliver of the Sun’s disc succumbed to the march of the Moon. There was the flash of Bailey’s beads through the Moon’s craggy limb and then totality – an extraordinary moment when time seems to stop and yet pass so quickly. For two minutes the corona and wispy prominences dazzled the crowd but a grand finale awaited. 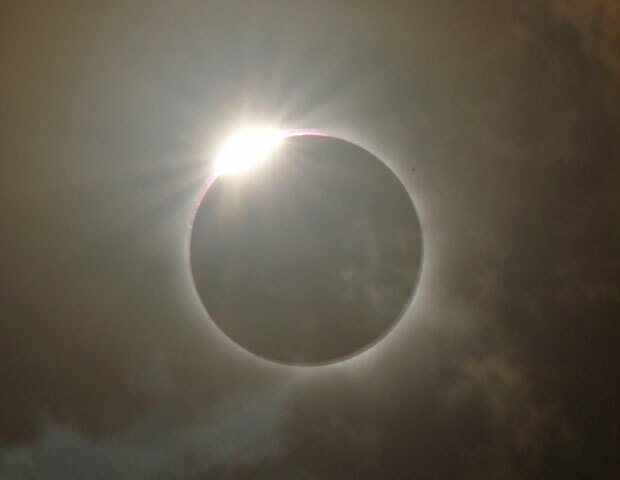 At totality’s end, the flash of the diamond ring was tinted by a large prominence and chromospheric projection that bathed the beach in vivid pink. Leaving behind the awed spectators, the shadow of the Moon raced across the Coral Sea away from Palm Cove, the moving darkness visible in the clouds that still hung in the sky. Clouds returned to obscure the very end of the partial phase of the eclipse but there were few complaints. The main attraction had not disappointed. 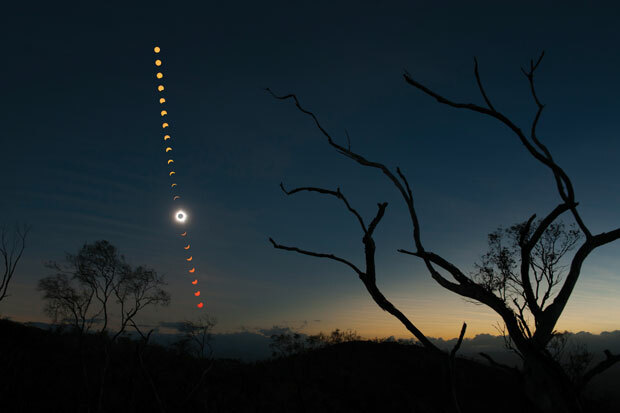 A digital multiple exposure of almost the entire solar eclipse seen from a hilltop about 20 miles west of the outback town of Mount Carbine, Queensland. Image: Ben Cooper/LaunchPhotography.com. Steven Young is the Managing Editor of Astronomy Now. 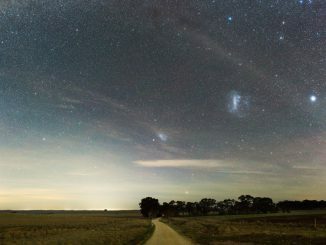 The Southern Cross constellation of the Milky Way, visible in the southern sky creates a guiding light along Bucklands Lane in Central Goldfields Shire, Victoria, Australia.